CALMOSINE Sleep is a natural and gentle food supplement that helps to restore a good night’s sleep. CALMOSINE Sleep has a particularly beneficial action in children from 1 year old facing sleep problems (difficulty falling asleep, frequent waking up during the night, waking up very early in the morning) : it soothes them and promotes sleep, helping to recover a regular sleep pattern. STUDY CONDUCTED ON 70 CHILDREN. 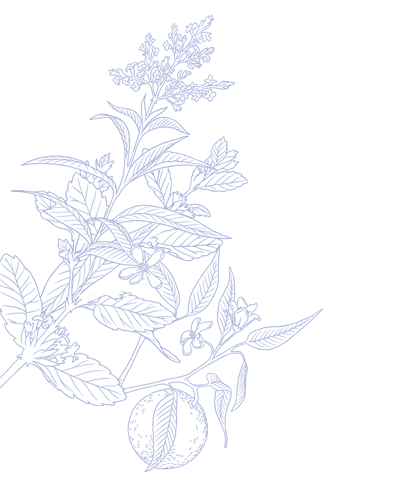 CALMOSINE SLEEP : “A FIELD STUDY SHOW THAT IT HELPS TREAT MILD SLEEP DISORDERS”. Designed and produced in France, CALMOSINE Sleep (sachets) is certified ORGANIC by the independant body Ecocert which approves the selection of raw materials, the formulation, the manufacturing process and labelling. This certification garantees the excellent quality of the products. A product range designed and produced in France. Made of carefully selected organic plants. A dedicated helpline to answer your questions. Sachets designed for a convenient use, wished by parents. Formula designed with pediatricians, pharmacists and midwives. 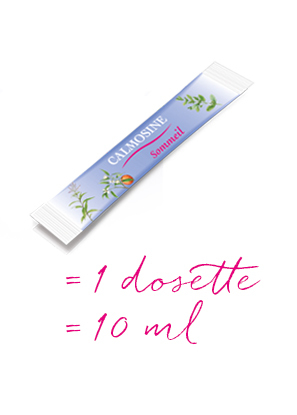 CALMOSINE Sommeil CONTAINS ORGANIC PLANT EXTRACTS, i.e. PLANTS GROWN AND HARVESTED BY FARMERS COMMITTED TO USING QUALITATIVE AND ENVIRONMENT-FRIENDLY GROWING METHODS. 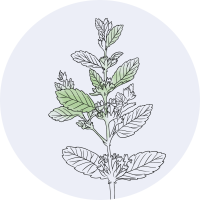 Lemon balm is a plant belonging to the Lamiaceae family that has been used for centuries to soothe restlessness and irritability, to make it easier to fall asleep and to improve sleep quality. 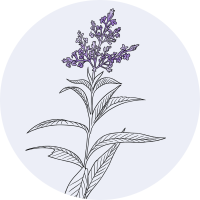 Lemon verbena is a plant belonging to the Verbenaceae family that helps restore regular sleep patterns thanks to its calming properties. 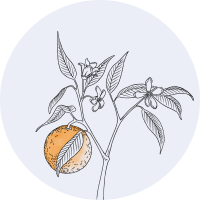 Orange blossom is a plant belonging to the Rutaceae family that is greatly appreciated by all thanks to its delicate and gentle fragrance. The composition of CALMOSINE sleep for the sachets (10 ml) : Water, plant extracts* (vegetable glycerin, lemon balm leaves* [Melissa officinalis], lemon verbena leaves* [Aloysia triphylla], orange blossoms* [Citrus aurantium], fructose*, acidifier: citric acid. To drink pure or diluted in a small amount of water, in the evening before going to bed. CHILDREN FROM 1 TO 7 YEARS OLD : 1 DOSE OF 10 ML. CHILDREN OVER 7 YEARS OLD : 2 DOSES OF 10 ML.